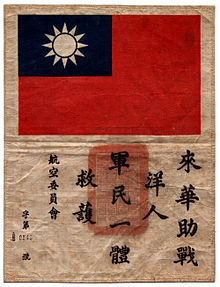 The First American Volunteer Group (AVG) of the Chinese Air Force in 1941–1942, nicknamed the Flying Tigers, was composed of pilots from the United States Army Air Corps (USAAC), Navy (USN), and Marine Corps (USMC), recruited under President Franklin Roosevelt’s authority before Pearl Harbor and commanded by Claire Lee Chennault. The aircraft were to fly with Chinese colors but be under American control. The mission was to bomb Japan and defend China but many delays meant they flew in combat after the US and Japan declared war. 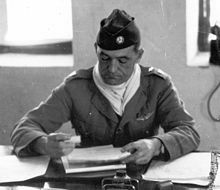 Chennault in his Kunming office, May 1942. He wears a US Army brigadier general’s star on his left shoulder but Chinese insignia otherwise. The American Volunteer Group was largely the creation of Claire L. Chennault, a retired U.S. Army Air Corps officer who had worked in China since August 1937, first as military aviation advisor to Generalissimo Chiang Kai-shek in the early months of the Sino-Japanese War, then as director of a Chinese Air Force flight school centered in Kunming. Meanwhile, the Soviet Union supplied fighter and bomber squadrons to China, but these units were mostly withdrawn by the summer of 1940. Chiang then asked for American combat aircraft and pilots, sending Chennault to Washington as an adviser to China’s ambassador and Chiang’s brother-in-law, T. V. Soong. Of the pilots, 60 came from the Navy and Marine Corps and 40 from the Army Air Corps. (One army pilot was refused a passport because he had earlier flown as a mercenary in Spain, so only 99 actually sailed for Asia. Ten more army flight instructors were hired as check pilots for Chinese cadets, and several of these would ultimately join the AVG’s combat squadrons.) The volunteers were discharged from the armed services, to be employed for “training and instruction” by a private military contractor, the Central Aircraft Manufacturing Company (CAMCO), which paid them $600 a month for pilot officers, $675 a month for flight leaders, $750 for squadron leaders (no pilot was recruited at this level), and about $250 for skilled ground crewmen. Some of the pilots were also orally promised a bounty of $500 for each enemy aircraft shot down, but no one knew if that would actually happen until they returned home and found the funds deposited in their bank. During the summer and fall 1941, some 300 men carrying civilian passports boarded ships destined for Burma. They were initially based at a British airfield in Toungoo for training while their aircraft were assembled and test flown by CAMCO personnel at Mingaladon Airport outside Rangoon. Chennault set up a schoolhouse that was made necessary because many pilots had “lied about their flying experience, claiming pursuit experience when they had flown only bombers and sometimes much less powerful aeroplanes.” They called Chennault “the Old Man” due to his much older age and leathery exterior obtained from years flying open cockpit pursuit aircraft in the Army Air Corps. Most believed that he had flown as a fighter pilot in China, although stories that he was a combat ace are probably apocryphal. Of the 300 original members of the CAMCO personnel, 9 were Chinese-Americans recruited from America’s Chinatowns. All 9 were trained at Allison Engineworks in Indianapolis, Indiana: all were P-40 mechanics. Upon arrival in Kunming, 2 other Chinese-Americans were hired, a Ford Motor truck specialist and a doctor. Total original Chinese-Americans were 11. 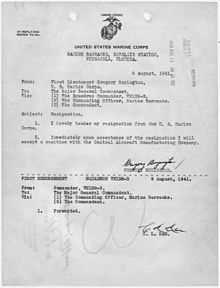 Prior to July 4, 1942, 3 of the P-40 mechanics resigned. The official AVG roster lists the original 8. When Japanese aircraft attacked, Chennault’s doctrine called for pilots to take on enemy aircraft in teams from an altitude advantage, since their aircraft were not as maneuverable or as numerous as the Japanese fighters they would encounter. He prohibited his pilots from entering into a turning fight with the nimble Japanese fighters, telling them to execute a diving or slashing attack and to dive away to set up for another attack. This “dive-and-zoom” technique was contrary to what the men had learned in U.S. service as well as what the Royal Air Force (RAF) pilots in Burma had been taught; it had been used successfully, however, by Soviet units serving with the Chinese Air Force. 1943: A Kittyhawk Mark III of 112 Squadron, taxiing through scrub at Medenine, Tunisia. The ground crewman on the wing is directing the pilot, whose view ahead is hindered by the aircraft’s nose. AVG fighter aircraft came from a Curtiss assembly line producing Tomahawk IIB models for the Royal Air Force in North Africa. 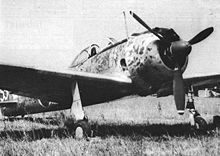 The Tomahawk IIB was similar to the U.S. Army’s earlier P-40B model, and there is some evidence that Curtiss actually used leftover components from that model in building the fighters intended for China. The fighters were purchased without “government-furnished equipment” such as reflector gunsights, radios and wing guns; the lack of these items caused continual difficulties for the AVG in Burma and China. AVG fighter aircraft were painted with a large shark face on the front of the aircraft. This was done after pilots saw a photograph of a P-40 of No. 112 Squadron RAF in North Africa, which in turn had adopted the shark face from German pilots of the Luftwaffe’s ZG 76 heavy fighter wing, flying Messerschmitt Bf 110 fighters in Crete. (The AVG nose-art is variously credited to Charles Bond and Erik Shilling.) About the same time, the AVG was dubbed “The Flying Tigers” by its Washington support group, called China Defense Supplies. The P-40’s good qualities included pilot armor, self-sealing fuel tanks, sturdy construction, heavy armament, and a higher diving speed than most Japanese aircraft – qualities that could be used to advantage in accordance with Chennault’s combat tactics. Chennault created an early warning network of spotters that would give his fighters time to take off and climb to a superior altitude where this tactic could be executed. The AVG’s first combat mission was on 20 December 1941, when aircraft of the 1st and 2nd squadrons intercepted 10 unescorted Kawasaki Ki-48 “Lily” bombers of the 21st Hikōtai attacking Kunming. The bombers jettisoned their loads before reaching Kunming. Three of the Japanese bombers were shot down near Kunming and a fourth was damaged so severely that it crashed before returning to its airfield at Hanoi. Later, Chinese intelligence intercepted Japanese communications indicating that only 1 out of the 10 bombers ultimately returned to base. Furthermore, the Japanese discontinued their raids on Kunming while the AVG was based there. One P-40 crash-landed; it was salvaged for parts. This mission was one of the earliest American aerial victories in the Pacific War. At this time, the focus of Japan’s offensive efforts in the AVG’s coverage area was southern Burma. The 3rd Squadron – 18 aircraft strong – defended Rangoon from 23–25 December. On 23 December, Mitsubishi Ki-21 “Sally” heavy bombers of the 60th, 62nd and 98th Sentai, along with single-engined Mitsubishi Ki-30 “Ann” attack bombers of the 31st Sentai, sortied against Rangoon. They were escorted by Nakajima Ki-27 “Nate” fighters of 77th Sentai. The Imperial Japanese Army Air Force (JAAF) formation was intercepted by the AVG and RAF Brewster Buffalos of 67 Squadron. Eight Ki-21s were shot down for the loss of three AVG P-40s. The 60th Sentai was particularly hard hit – it lost five out of the 15 bombers it had dispatched. Nevertheless, Rangoon and Mingaladon airfield were successfully bombed, with the city suffering more than 1,000 dead. Two Buffalos and two P-40s were destroyed on the ground, and one P-40 crashed when it attempted to land on a bomb-damaged runway. On 25 December, the JAAF returned, reinforced by Ki-21s of 12th Sentai and Nakajima Ki-43 Hayabusas (Oscars) of the 64th Sentai (Colonel Tateo Katō‘s Flying Squadron). A total of 63 bombers escorted by 25 fighters were committed. These were intercepted by 14 P-40s of the AVG’s 3rd Squadron and 15 Buffalos of 67 Squadron. In the two encounters, 35 Japanese bombers and fighters were shot down. The Allies lost two pilots and five P-40s. Mingaladon airfield was once again damaged, and eight Buffalos were destroyed on the ground. After its losses in the 23–25 December battles, the 3rd Squadron was relieved by the 2nd Squadron “Panda Bears”, which carried out a series of raids on JAAF airbases in Thailand. The Japanese had moved aircraft to Malaya to finish off Singapore, and its remaining aircraft in the area (the 77th, 31st and 62nd Sentai) launched fighter sweeps and counter raids on the Allied airfield at Mingaladon. On 12 January, the Japanese launched their Burma Campaign. Significantly outnumbered, the AVG was gradually reduced through attrition, but often exacted a disproportionate toll of their attackers. On 24 January, six Ki-21s of the 14th Sentai escorted by Ki-27s attacked Mingaladon. All the Ki-21s were shot down by the AVG and RAF defenders. On 28 January, a fighter sweep of 37 Ki-27s was engaged by 16 AVG P-40s and two RAF fighters. Three “Nates” were shot down for the loss of two P-40s. The next day, another sweep of 20 Ki-27s of the 70th Sentai was met by 10 Allied fighters (eight P-40s and two Hawker Hurricanes). Four were shot down for the loss of no Allied aircraft. 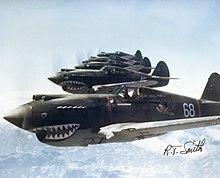 Despite these minor victories and Chennault’s reinforcement of the “Panda Bears” with pilots from the “Adam and Eves”, by mid-February, only 10 P-40s were still operational at Mingaladon. Commonwealth troops retreated before the Japanese onslaught, and the AVG was pressed into the ground attack role to support them. One unfortunate result of these missions was a prolonged air attack on a suspected Japanese column on 21 February that turned out to consist of Commonwealth troops. More than 100 Allied lives were lost in this friendly fire incident. On 27 February, after hearing that the RAF was retreating and pulling out its radar equipment, the AVG withdrew to bases in northern Burma. Reinforced by new P-40E “Kittyhawks” and by repaired aircraft from the AVG’s excellent maintenance group, 12 P-40s were based at Loiwing on 8 April. Despite the long retreats, their losses and incessant air combat, the AVG still retained their abilities. That day, 12 Oscars from the 64th Sentai raided the base. In the ensuing series of dogfights, four Ki-43s were downed in exchange for one P-40E destroyed on the ground. During this period, Chinese and American commanders pressured Chennault to order his pilots to undertake so-called “morale missions”. These were overflights and ground attacks intended to raise the morale of hard-pressed Chinese soldiers by showing they were getting air support. The AVG’s pilots seethed with resentment at these dangerous missions (which some considered useless), a feeling which culminated in the so-called “Pilot’s Revolt” of mid-April. Chennault suppressed the “revolt” and ordered the ground attack missions to continue. But despite their efforts, the Allied situation in Burma continued to deteriorate. On 29 April the AVG was ordered to evacuate Loiwing and relocate to Baoshan in China. Like the AVG’s other bases, Baoshan was repeatedly bombed by the Japanese Army Air Force. Still, the AVG scored against their JAAF tormentors, bringing down four “Nates” of the 11th Sentai on 5 May and two “Anns”. By 4 May, the successful Japanese Burma offensive was winding down, except for mopping up actions. One of these was an attempt by a regiment of the Japanese 56th Division to drive for Kunming, an effort that was stopped by the Chinese army operating with strong air support from the AVG. On 7 May the Japanese Army began building a pontoon bridge across the upper Salween River, which would allow them to move troops and supplies into China and drive towards Kunming. To stem this tide, 2nd Squadron Leader David Lee “Tex” Hill led a flight of four new P-40Es bombing and strafing into the mile deep Salween River Gorge. During the next four days, the AVG pilots flew continuous missions into the gorge, effectively neutralizing the Japanese forces. This prevented a Japanese advance on Kunming and Chungking; the Japanese never advanced farther than the west bank of the upper Salween. Claire Chennault later wrote of these critical missions, “The American Volunteer Group had staved off China’s collapse on the Salween.” Despite being on the defensive thereafter, the AVG continued to harass the JAAF with raids on their Vietnamese bases. With the Burma campaign over, Chennault redeployed his squadrons to provide air protection for China. The Doolittle Raid had prompted the Japanese to launch an offensive to seize AVG air bases that could be used for attacks on the Japanese homeland. By 1 June, personnel that would form the nucleus of the new USAAF 23rd Fighter Group (the AVG’s replacement) were beginning to trickle into the theater. Some of the last missions the AVG flew were defending Guilin against raids by JAAF Nates, Lilys, and new Kawasaki Ki-45 Toryu (“Nick”) heavy fighters. The AVG’s last combat was over Hengyang on the day it was disbanded, 4 July 1942. In this final action, the AVG shot down four Ki-27s with no AVG losses. Flight leader and fighter ace Robert “R.T.” Smith stands next to his P-40 fighter at Kunming, China. The “Flying Tiger” insignia was created by the Walt DisneyCompany. The AVG lacked many resources. Despite its location in areas with malaria and cholera, it had only “four doctors, three nurses and a bottle of iodine.” Pilots found the food disgusting, and the slow mail from home and lack of women hurt morale. A squadron had 45 maintenance personnel compared to the normal more than 100, and only one base could perform major repairs.Nonetheless, the AVG was officially credited with 297 enemy aircraft destroyed, including 229 in the air. Fourteen AVG pilots were killed in action, captured, or disappeared on combat missions. 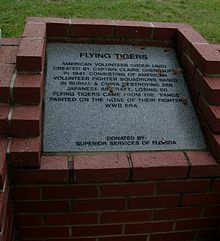 Two died of wounds sustained in bombing raids, and six were killed in accidents during the Flying Tigers’ existence as a combat force. The AVG’s kill ratio was superior to that of contemporary Allied air groups in Malaya, the Philippines, and elsewhere in the Pacific theater. The AVG’s success is all the more remarkable since they were outnumbered by Japanese fighters in almost all their engagements. The AVG’s P-40s were superior to the JAAF’s Ki-27s, but the group’s kill ratio against modern Ki-43s was still in its favor. In Flying Tigers: Claire Chennault and His American Volunteers, 1941–1942, Daniel Ford attributes the AVG’s success to morale and group esprit de corps. He notes that its pilots were “triple volunteers” who had volunteered for service with the U.S. military, the AVG, and brutal fighting in Burma. The result was a corps of experienced and skilled volunteer pilots who wanted to fight. Gregory “Pappy” Boyington broke his contract with the AVG in the spring of 1942 and returned to active duty with the U.S. Marine Corps. He went on to command the “Black Sheep” Squadron and was one of two AVG veterans (the other being James H. Howard of the USAAF) to be awarded the Medal of Honor. David Lee “Tex” Hill later commanded the USAAF 23rd Fighter Group. Allen “Bert” Christman, who bailed out at Rangoon, was strafed and killed while parachuting to the ground in January 1942, had earlier scripted and drawn the Scorchy Smith and Sandman comic strips. Journalist Joseph Alsop served as Chennault’s “staff secretary” while the AVG trained at Rangoon; he was interned at Hong Kong on Christmas Day, 1941. The success of the AVG led to negotiations in spring 1942 to induct it into the USAAF. Chennault was reinstated as a colonel and immediately promoted to brigadier general commanding U.S. Army air units in China (initially designated China Air Task Force and later the 14th Air Force), while continuing to command the AVG by virtue of his position in the Chinese Air Force. On 4 July 1942, the AVG was replaced by the 23rd Fighter Group. Most AVG pilots refused to remain with the unit as a result of the strong arm tactics by the USAAF general sent to negotiate with them. However, five pilots accepted commissions in China including “Tex” Hill, one of Chennault’s most loyal devotees, with others remaining for a two-week transition period. (U.S. airmen and the press continued to use the “Flying Tiger” name to refer to USAAF units in China to the end of the war, and the name continues to be applied to certain air force and army aviation squadrons.) Most AVG pilots became transport pilots in China, went back to America into civilian jobs, or rejoined the military services and fought elsewhere in the war. One of the pilots drawn to the success of the AVG was Robert Lee Scott, Jr. who was flying supplies into Kunming over the Hump from India. He convinced Chennault to loan him a P-40 which he flew to protect the supply route; his aggressiveness led to Chennault’s recruiting him as commander of the 23rd Fighter Group. Scott brought recognition to his exploits and those of the Flying Tigers with his 1943 bestselling autobiography God is My Co-Pilot that was then made by Warner Bros. into a popular film in 1945. There are several museum displays in the United States honoring the Flying Tigers. The National Museum of the United States Air Force in Dayton, Ohio, has an extensive display dedicated to the AVG, including an A-2 jacket worn by an AVG pilot in China, a banner presented to the AAF by the Chinese government, and a P-40E. The National Museum of Naval Aviation in Pensacola, Florida also has a Flying Tiger display. 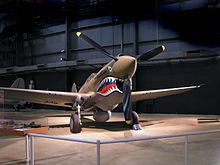 The Chennault Aviation Museum in Monroe, Louisiana has an extensive collection of Flying Tigers and AVG memorabilia. The AVG monument in the National Museum of the United States Air Force Memorial Garden features a marble sculpture of a pagoda crowned with a brass model of a P-40; the monument stands nearly 14 feet tall. The Palm Springs Air Museum has a display of memorabilia inside a mockup of AVG ground facilities, with a P-40N painted in AVG markings. Finally, a memorial to the AVG and 14th AF is located at Vandenberg Air Force Base in California, depicting a P-40 in AVG markings with a bronze plaque describing the unit’s history and Vandenberg’s role as headquarters for the 14th AF. There are also several memorials to the AVG in Asia. In Chiang Mai, Thailand, a marble obelisk was dedicated on 11 November 2003, inscribed to Chennault; to Jack Newkirk, who was killed in North Thailand on 24 March 1942; and to Charles Mott and William McGarry, who were shot down and captured in Thailand. In Taiwan, Madame Chiang Kai-Shek requested a statue of Chennault in the New Park of Taipei to commemorate this wartime friend after his death (the statue has since been relocated to Hualian AFB). A Flying Tigers Memorial is located in the village of Zhijiang, Hunan Province, China and there is a museum dedicated exclusively to the Flying Tigers. The building is a steel and marble structure, with wide sweeping steps leading up to a platform with columns holding up the memorial’s sweeping roof; on its back wall, etched in black marble, are the names of all members of the AVG, 75th Fighter Squadron, and 14th Air Force who died in China. In 2005, the city of Kunming held a ceremony memorializing the history of the Flying Tigers in China, and on 20 December 2012, the Flying Tigers Museum opened in Kunming. The date is the 71st anniversary of the first combat from Kunming of the Flying Tigers. The Memorial Cemetery to Anti-Japanese Aviator Martyrs in Nanjing, China features a wall listing the names of Flying Tiger pilots and other pilots who defended China in World War II, and has several unmarked graves for such American pilots. The wreckage of a P-40 with CAF serial number P-8115 is on display in Chiang Mai, Thailand. The aircraft is believed to be that flown by William “Mac” McGarry when he was hit by anti-aircraft fire while flying top cover over Chiang Mai on 24 March 1942. The aircraft crashed into the rain forest in northern Thailand. McGarry was captured and interrogated, and spent most of the war in a Thai prison. Toward the end of the war the Office of Strategic Services (OSS) arranged for the Free Thai Movement to spirit him out of the prison to a PBY Catalina in the Gulf of Thailand. The wreck of his P-40 was discovered in 1991, and consists of the P-40’s Allison engine, Hamilton Standard propeller and parts of the airframe. Today the wreckage is displayed at the Tango Squadron Wing 41 Museum in Chiang Mai, Thailand. The wreck of another AVG P-40 is believed to be in Lake Dianchi (Lake Kunming). The fighter is believed to be a P-40E piloted by John Blackburn when it crashed into the lake on a gunnery training flight on 28 April 1942, killing the pilot. His body was recovered from the aircraft, which was submerged in 20 feet of water. In 1997 a U.S.-Chinese group called the Sino-American Aviation Heritage Foundation was formed to locate the aircraft and possibly raise and restore it. In March 1998, they contacted the China Expedition Association about conducting the recovery operation. Over 300 aircraft are believed to have crashed into Lake Dianchi (including a second AVG P-40) so locating the aircraft proved difficult. In 2003, an aircraft believed to be Blackburn’s was found embedded in nine feet of bottom silt. An effort was made in September 2005 to raise the aircraft, but the recovery was plagued with difficulties and it remains deep under the lake bottom. Since the aircraft was complete and relatively undamaged when John Blackburn’s body was removed from it in 1942, it is hoped that the aircraft will be in good condition and capable of being restored, possibly to flying condition. Just before their 50th reunion in 1992, the AVG veterans were retroactively recognized as members of the U.S. military services during the seven months the group was in combat against the Japanese. The AVG was then awarded a Presidential Unit Citation for “professionalism, dedication to duty, and extraordinary heroism.” In 1996, the U.S. Air Force awarded the pilots the Distinguished Flying Cross and the ground crew were all awarded the Bronze Star Medal. A number of feature films have referenced the AVG directly or indirectly, the most famous being Flying Tigers, a 1942 black-and-white film from Republic, starring John Wayne and John Carroll as fighter pilots. Other wartime films with an AVG angle included The Sky’s the Limit (1943, starring Fred Astaire as a Flying Tiger ace on leave); Hers to Hold (1943, with Joseph Cotten); God is My Co-Pilot, (1945, with Dennis Morgan as Robert Lee Scott, Raymond Massey as Chennault, and John Ridgely as Tex Hill); and China’s Little Devils (1945). In the Star Wars guidebook The Essential Guide to Warfare, an X-wing Starfighter squadron named the “Lightspeed Panthers” was mentioned in the book. 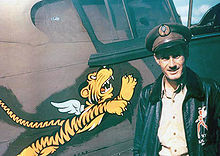 Warfare co-author Paul R. Urquhart confirmed in Warfare‘s endnotes that the squadron was intended to be a direct reference to the Flying Tigers.